The best list ever of gold-combinations! This gold is done by @jens_colouring, with Derwent Artist. The list of pencil-combinations here is a mix of the ones I´ve already written about (Gold, with colored pencils), and new ones, collected by my dear coloring friend @florabythesea . She asked her followers on Instagram to share their favourite pencil-combinations for gold, and she got some great new combos to try out! Add spanish orange for some shine! Författare PassionistacoloristaPostat 5 mars, 2019 5 mars, 2019 Lämna en kommentar på The best list ever of gold-combinations! I know that Pinterest is filled with beautiful pictures, and lineart, but you can’t always be sure the illustrator actually want the picture to be out there, for free. Luckily, a lot of illustrators are very generous with offering freebies from time to time. Mostly you will find their freebies on their webpages or on Instagram or on their pages on Facebook. I have seen that a lot of illustrators have done special pictures for Valentine’s day right now! Most of them are for sale, but some are free, and in this post I will tell you about the freebies I know about at the moment! And because I’m hosting a cat color along on Instagram in February (#cozycatalong) I will also show you some cat-freebies I’ve found, that you can use, if you want to join my color along, but don’t find any cat in your books. This is a Valentines- (and cat!) freebie from Jen Katz (@katzundtatz), that you can find a link to on her Instagram-page. This heart, made by Johanna Basford, for Enchanted forest, is still available as freebie on her webpage! This is a New freebie from the illustrator of the new coloring book Mysteria; Anastasia Elly Koldareva. You can find this, and her other freebies, on her webpage. The illustrator Edwina Mc Namee is generous with freebies, for example this one. You will find them all on her Facebookpage. Another very generous illustrator is Konstantinos Liaramantzas, who has a lot of freebies on his Facebook-page, more than one with cats! And today I saw this on Instagram! It’s a page drawn by Bianca State (@crayoniverse) , and offered as a freebie! You can find it here. And remember to always give cred to the illustrator when you are uploading your WIP:s and finished pictures on Instagram and Facebook! Författare PassionistacoloristaPostat 8 februari, 2019 8 februari, 2019 Lämna en kommentar på Valentines- and cat-freebies! Ness Butler’s amazing christmas coloring! Every day I see extraordinary pictures, colored of you amazing colorista artists! One of those pictures is this, colored by Ness Butler (@forestlovecolouring) When I saw it, in Johanna Basford Your Pages group I was speechless! So I asked Ness how on earth she has made it! And she kindly sent me these pictures, so we can see the process, to share with you all! Merry christmas! Författare PassionistacoloristaPostat 21 december, 2018 Lämna en kommentar på Ness Butler’s amazing christmas coloring! My christmas calender and links to free christmas-pictures! This time of year, we are a lot of people who likes to color pictures with a christmas-feeling in. I have not started my christmas-pictures yet, but at least I´m coloring some pages with winter-theme, in Botanicum, by Maria Trolle. After that I have plans to color in my new winter-book by Molly Harrison, in Johanna’s christmas by Johanna Basford, and in Seasons coloring book by Hanna Karlzon. I am doing this as a color along on youtube, where I pick a note from a tin, Every day until christmas (24 days), and Some of my followers helped me to come up with creative challenges, that I wrote on the notes, and put in this tin. The first challenge (day 1) was to color the picture with skin Tones. The second challenge (today) was to color the picture with just brown and white. If you want to join, you can do it with whatever picture you want, from Any coloring book, if you can find a picture with 24 different parts/details. I have so many Wonderful pictures in my books, but there are also so many wonderful Seasonal freebies right Now, from great illustrators. Författare PassionistacoloristaPostat 2 december, 2018 Lämna en kommentar på My christmas calender and links to free christmas-pictures! I know we are a lot of people that thinks it´s difficult to color gold, with colored pencils. I am NOT any expert at coloring gold, but there are others that have found great pencil-combinations for creating that feeling of shiny gold, and in this post I´m going to share these combinations with you. Recently I talked to Caroline (@wik_coloring) on Instagram, for my coloring book podcast, Passionistacolorista, and she is really good at coloring gold. She has two different combinations, both with Polychromos, and I asked her if I could share them with you, here on my blog, and she said yes. Blenda med den vita pennan. These two combinations are made by Malin Holmberg, a coloring friend in Sweden, who talked about coloring gold in my Swedish coloring book podcast, Målarbokspodden, last year. My coloring friend, Matilda Furness, (@matildasysteryster on Instagram), shared this great color-combo with me, that she used on this amazing valkyrie in Serene coloring book, by Nicholas Filbert. I´m no big Halloween-fan, because this holiday is quite new in Sweden. I like the Swedish Allhelgona (All Saints’ Day), more, where we go to the cemetery and light candles for loved ones, that´s no longer with us. Still, I think it´s fun to color some Halloween-pictures, and I know this is a HUGE thing in the US. 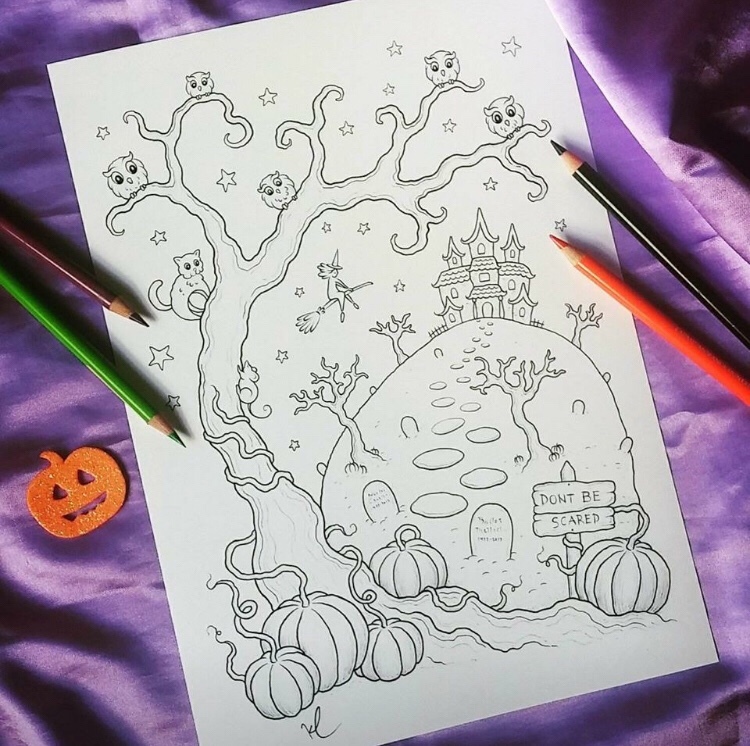 But if you don´t want to buy a whole book, and cannot find any picture in your books, I found some free Halloween-downloads, you can print and color in! I think a lot of my coloring friends have heard me say this: ”You can always cover it with black Posca!”. It has been my back-up-plan for experimental backgrounds for a long time. But actually I don´t think it´s that easy to do black backgrounds with Poscapen. I know this is how a lot of people, in the coloring community, makes black backgrounds, but there is a lot of other ways too (as you can read more about on my Instagram, here: Black backgrounds in coloring books ). Lately I´ve started to do my black backgrounds with a mix of Poscapen and acrylic paint, and I think the result, for me, is better than before, but not perfect. This weekend I´ve made three black backgrounds in Seasons coloring book, with this method. My coloring friend, Pernilla, says that she only needs one layer of acrylic paint, for her backgrounds, but I needed to do two layers, before it covered enough. – A much more fast way to do black backgrounds, than with Posca. – Cheaper than Poscapens (you can not use the same pen for a lot of big backgrounds before it runs out). – Makes a more even background, than poscapens. – A easy way to add black close to the picture, without getting black on the wrong side of the lines. – Because it´s acrylic paint, in the pens, it covers really well, and you get a really black, matt, background. – The pens can be more easy to handle, than a brush. – You vill just need one layer, for good coverage. (You can do two layers, but it´s not super-easy, and the surface looks a bit different than with just one layer). – It is difficult to use it around the picture, and small details. I guess you can do it, if you have a steady hand, and a small brush, but I cannot do it. – It needs two layers before it covers enough (at least the acrylic paint I bought). – It can be difficult to get a perfect amount of colour coming from the pens: You need to shake them often (with the cap on), and press the tip on a paper, until you get perfect flow. And you need to repeat this, often! – You will need different sizes of the pens, one smaller, to use close to the picture, and around small details, and a bigger, for better coverage on big areas, which costs a bit of money. – The tip can be a bit strange after a while, it´s like it has been worn out, and can drop some fluff into the picture. You can still use the pen, and you can just take the fluff away with your finger, but it doesn´t glide over the paper as good as before this happened. So right now I´m mixing these two; the pens and the acrylic paint. But as I already said: It´s not perfect either. The posca and the acrylig paint doesn´t look exactly the same on the paper, so you can see where the posca ends, and the acrylic paint begins. At least my acrylic paint, is not exactly the same black as the Posca. What do you use for black backgrounds?